Workshop Participants. Back row, L to R: Julia Hornberger (Wits, South Africa), Jeffrey Martin (Hong Kong U, Taiwan), Daniel Goldstein (Rutgers, Bolivia), Susana Durao (U Campinas, Portugal), Duncan McCargo (Leeds U, Thailand), Didier Fassin (IAS, France), Steven Herbert (U Washington, United States), Clara Han (Johns Hopkins, Chile), Elif Babül (Mount Hollyhoke, Turkey). Front row, L to R: Beatrice Jauregui (U Toronto, India), Helene Maria Kyed (Dansk IIS, Mozambique). 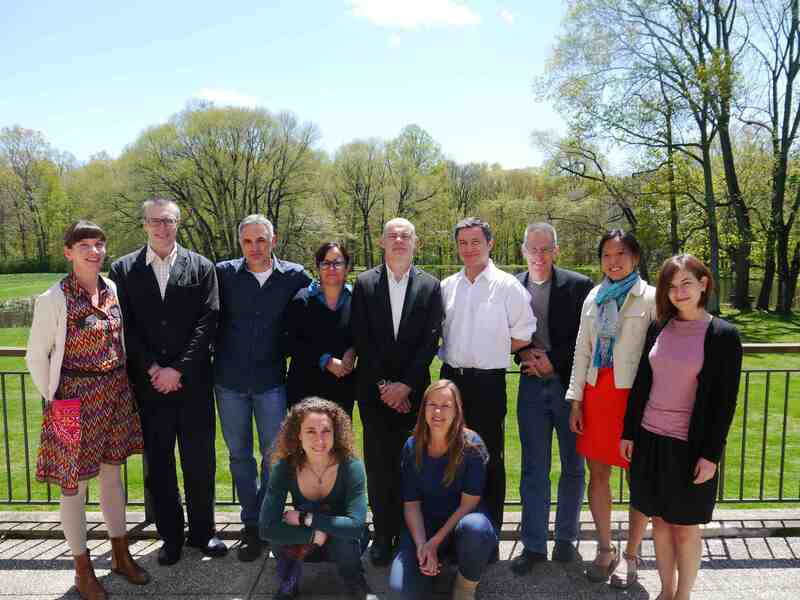 From May 4-7, 2014, a workshop was held at the Institute for Advanced Study on the topic of “Ethnography and Policing.” Below is a short summary of the workshop’s premise and scope, as described by Didier Fassin, who organized the gathering. In the past half century, there has been a considerable amount of scientific literature in criminology, sociology, political science and legal studies on urban policing, that is, on the practice of law enforcement mostly in the poor neighborhoods of large cities. Part of this work is grounded on some form of participant observation, which complements other techniques such as interviews or questionnaires, and nourishes the analytical and theoretical arguments developed by the authors. However, this ethnography rarely appears as such. It is usually not presented, save occasionally in the form of short vignettes, or discussed, from the perspective of the specific contribution of this method. Significantly, until recently, anthropologists themselves seemed to ignore policing practices. In the past decade, however, this situation has begun to change, as scholars increasingly and explicitly include ethnographic elements in their study of police work. The objective of the workshop was to bring together social scientists who have conducted research on urban policing in different parts of the world, using ethnography, in order to collectively reflect on the conditions, potentialities and limits of this method, the problems of interpretation and the ethical issues it raises, and the way local findings can be related to larger historical context and sociological issues. The general idea was to take ethnography seriously rather than as a mere background rendered invisible in the process of writing. Considering the importance of public debates on policing in contemporary societies, particularly on the way law is enforced in poor neighborhoods, which raises questions about racial discrimination, display of violence, and reproduction of an unequal social order, the exchange of ethnographic experiences has been rich. The outcome of this workshop will be a collective volume.